usual Scale of Pay and allowances as admissible under the Rules. Educational Qualification: Class-VIII Passed. Candidates is also have a professional Driving Licence (L.M.V.) issued by the competent Authority, Only professional Driving Licence holder can apply. Age: 18 to 38 years as on 01-01-2015, the relaxation of upper age limit for reserve category will be as per rule in force. a) Photo Copies of all Certificates in Support of qualification, age, caste and other testimonials. 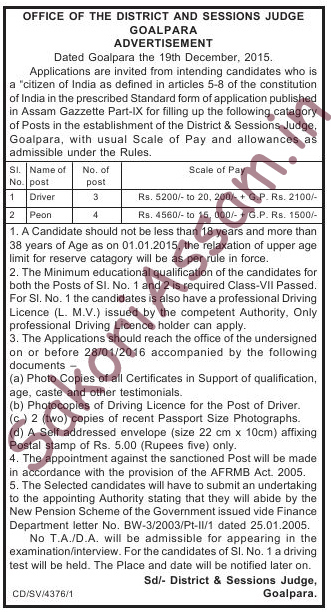 b) Photocopies of Driving Licence for the Post of Driver. c) 2 (tow) copies of recent Passport Size Photographs. d) A Self addressed envelope (size 22cm x 10cm) affixing Postal stamp of Rs.5.00 (Rupees five) only.